PTR SPECIFIC - If you copy a character get ready for a lot of lag, and your talent trees are set to zero so reset them right away. You also cannot load mods into the PTR so you're stuck with the default wow interface. I was also asked to rename my character, after asking most/everyone is asked to do this for the PTR, it doesn't affect your live character. WOTLK GENERAL - There is a new mount window. If you want to mount up on the PTR, and I think in WOTLK, you need to hit SHIFT+P to access the mount page, then drag a mount icon onto your toolbar, or keep going back to the mount page to click the icon. I was also told that once you drag a mount icon onto the page, you can delete the mount from your bag. Havn't actually tried it yet, but will do so later to double check. PALADIN SPECIFIC - Sanctity arua is gone. I don't remember reading that before, but there is no sanctity aura for ret pally's. That makes Retribution aura the only offensive aura available. You'll want to put some talent points into it now I think. 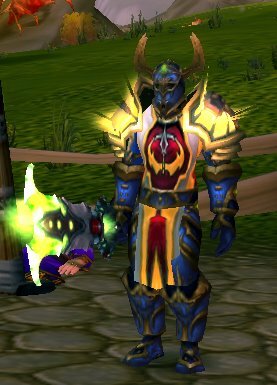 My crusader aura seems to be always on, in addition to whatever combat aura I choose. I have access to the blood elf paladin mount. I did go after a couple 63 level mobs just outside shat, the damage seemed to only be white, even though it was spell damage, but the average hit was about 1,500k. I don't belive that was a crit. This is a bug with the transfer. It will go away the first time you die. Happened to me when I transferred servers on Live.